It has been a while since I looked at a DC Superhero Girl. I was actually on the Mattel Toy Shop site at the end of last year since I heard they had She-Ra for a super good price. I saw that they had some Katanas left for an awesome price as well, so I pounced on the deal. I got her, took pictures, and then they sat in a folder on my desktop since January. It is June! Time to clean house I guess. Well, the box art is what this set is all about. The fine people at Mattel did a fantastic job with some amazing art on all sides of the box. Inside the outer box is a window-box that portrays Katana about to be attacked by some other bad girls. Slide the box open and there you have the doll. She looks ready for action. She is clad in armor, holding her katana blade. Along with the katana is a bladed staff, 2 sai, a knife, and 4 throwing stars for good measure. That is a lot of accessories for a DCSG. Way more than any of the other girls get. That is to be expected in a SDCC exclusive set. She has a stand with her name on it. The sheath of the sword attaches to the base to make a really nice display. She is able to hold all of her weapons, except for the throwing stars. They are a bit on the small side for her grasping hands. It was a nice touch to include sheaths for the weapons. She is able to wear the knife on her back. There are a lot of parts that make up Katana. All of the armor comes off, leaving her in a grey/black suit. You can see that her arms are two different colors, so she is limited to wearing one outfit. Similar to Harley Quinn with painted legs. This is a nice set. I do not like how she is looking off to the side. It makes it hard to pose her for photo shoots with the other girls. I saw she is still available on Amazon, but the price is back up to $90. Fear not, the standard version is out now, and is $21.99. Way better in price. I have not seen her in the wild yet. She was supposed to be coming out with Frost, who I have also not seen the wild. I will keep my eyes peeled for them. Until then, there are lots of other great girls that have come out that we will be looking at shortly. My last submission for the Super Hero Girls Harley looks great. She is one of the top three of the girls that have have come out. She looks great in her red, blue, and black outfit. Her hair is looking rather Suicide Squad, which is timely, and a great way to go. She comes with a mask for her face, and a hammer for her hands. She is also decked out in a pair of boots that look like they are not afraid to stomp on you. If only she had tights. No, those legs are painted that color, and that takes her down a bit for me. This figure would have been totally amazing if she had a pair of tights instead of paint. I know, I know, it should be Ivy and Harley, but I really felt these two would work better together. I really liked the first two DC Super Hero Girls I reviewed, Batgirl, and Wonder Woman. These two are not my favorite. Of course when you show up to the party with 6 new girls, all of them are not going to be everyone’s cup of tea. Now that is not to say I don’t like them. They are both very nice figures, and overall they do a good job representing the character. Who knows? If I had opened these girls first, I may have liked them a lot more, but they were up against some tough competition. I love Poison Ivy’s hair. It is a beautiful blend of reds and oranges. Mattel went to a lot of trouble to get a really nice blend of colors. I get a strong Barbie vibe from her that I didn’t get from either Batgirl or Wonder Woman. I think it may be a bit of the painted on face, and a lot to do with the outfit. I think it is less glamorous than her outfit in the show. This outfit is very similar, but there is a lack of flow and dress quality that she has in the show. The shoes had a lot of potential, but other than the vines that wrap around her legs, the shoes are really boring. I would really liked to have seen some amount of detail in the shoes, but they are lacking any, and one of mine was even miscast, and it had a bubble in it, which now left a hole. Ugh! Once again the articulation works really well. Lots of good movement all over, including great articulation in the rib cage area that really helps to make the figures more dynamic. It is kind of expected that Supergirl would definitely end up with a Barbie vibe. A painted face with blond hair. What she does have going for her is the great athletic build that all of the DC Super Hero Girls have. She is the first in the line with a skirt on, and she looks great wearing it. She also wears a pair of hightop sneakers with socks, and they are really cute with her overall outfit. The only real letdown with the outfit is the cape. It attaches to two pegs in the back of her necklace. I can’t imagine why they would make a rubber/plastic cape when the rest of her outfit is such great fabric material. It would have been so easy to make a fabric cape. Instead she is back-heavy with the plastic cape. The rest of the outfit, top/skirt combo look great, and have a real nice textural difference to make the outfit really stand out. I had some trouble with her hair. Unlike the rest, Supergirl’s hair feels like a different material. It is very silky, and though it feels nice, it is a bit unruly, and hard to control. I may have to end up washing it to get it to lay right. Anyway, I digress from the reason I am writing this today. She is a fantastic doll. She shares many similarities with Batgirl, who I looked at last week, but she is unique enough that you don’t feel like you are buying the same doll with a different head. Her skin color is a bit darker than Batgirl’s, but that is to be expected, since Batgirl hangs out in the night, and is red haired, which would lend itself to fairer skin. Unlike the action figure I looked at last week with purple hair, this version of Wonder Woman is much better to the correct color. They even gave her some blue highlights, which is similar to the show, but in the show there is a bit more of a purple color to it, but the blue is a bit of a nod to the original comics that colored black hair with blue highlights. She comes with her standard outfit she wears around school. It is easy to see how they could go about making a few different versions of WW, including one where she is in her armor. That would be pretty neat to see. Overall the outfit is spot on. Her shirt sleeves are short enough that they show off her strong arms. Her pants are pretty tight, and show that this is a muscular woman, and not some skinny Barbie doll under there. Her accessories are a lot of gold. Gold shoulder armor that has a bit of trouble staying in place when playing with her. She has a belt that has a clip for her Lasso of Truth. I don’t know why they made her lasso with a clip to attach to her belt, but also left it out like she is using it. It does not look good on her belt when it is not coiled up. I think I might have to see about getting something to make a more realistic and functioning lasso. In all, this is another great figure in the DC Super Hero Girls line. I think people are going to be quite fond of these dolls as they get them out of the packaging. They are self-standing, so you don’t have to worry about Monster High type stands. They are a sturdy toy that will last a long time, or adorn the shelves of collectors and show watchers. PS Happy 6th Anniversary to being on WordPress. It has been a fast 6 years. So much has happened. I am looking forward to continuing on. DC Seems to have really gotten it’s act together here at the start of 2016. They looked at their properties and figured out something fantastic. Sell items in the mass market, make good money, and influence a generation of girls. I think they also know they cannot compete with Marvel on the movie front, so they are going to what they are REALLY good at…animation. And what better way to pull a new generation in than with some younger content? This is going to hit big! The New DC Super Hero Girls come in two sizes, the 6 inch action figure, and the taller 12 inch doll. There is also an influx of clothing and even wearable action accessories. Today we are looking a one of each of the toys. I was really interested in getting my hands on Wonder Woman for both figures, to be somewhat consistent, but Wonder Woman is a favorite, and with a movie coming out in the very near future that she plays a major roll in, it is no wonder that she is harder to find. I ended up with my second choice of Batgirl, but once i got her out of the box, I think she may be my #1 pick. It will be hard to beat her overall look and accesories. Taking in her full body look, I am digging the design features. She is wearing a hoodie that has ears on top. Of course she is wearing her black mask as well. To go with the black mask, she also has a black winged backpack. She has on gauntlets of yellow and finishing off her arms are really well detailed black-gloved hands. She has one open hand and one grasping hand. She is wearing black pants that are on the snug side, but not skin tight. She finishes off her look with a pair of yellow combat boots. She has such a beautiful face. It is a bit smoother than the beauty look of Monster High or Barbie Dolls. Her eyes and eyebrows are painted on with a line of perfection. She does not have any extra makeup over a bit of pink lip gloss. Her backpack is a solid piece that has great detailings all it’s own. She has the requisite bat wings along with details of zippers and a pocket. Her gauntlets are removable. As you would expect from the makers of Monster High, Mattel did really good with the body parts, allowing for the hands to be pulled off to remove the gauntlets. The only thing I don’t like about the gauntlets is that they cover some really good forearm detail. This girl has some muscle, and the forearms are great. Take a peek under that sleeve, and you can see Batgirl has a pair of concealed weapons. She has good muscle tone going on all over the place. In the store, and in the box, it is a bit hard to tell, but side by side, there is a fairly large discrepancy between DC Super Hero Girls and Monster High. It is clear that Mattel went with whole new bodies for this line. It is a bummer for the people out there with a large number of MH dolls. Sorry, your DC Girls will not be borrowing anything from your MH girls. There is definitely a difference between the two lines, but not as big as you might think. Tailored to girls, they can choose which size they like better. They may not want to deal with the hair and the clothes all of the time. Maybe they want the Girls to play with some friends from the Marvel Universe. By going with two sizes, it allows the kids to vary what they play with. It is also nice for parents who may be on a budget. The price difference is about double. $9.99 for the 6 inch figures, and $19.99 for the 12 inch figures. For the level of detail, and accessories, I think they are right on the price point they should be. $10 for an action figure is a steal these days, with Marvel Legends going for $19.99 to $21.99 depending on the store. This little Wonder has great articulation. I guess that is what you get when you hand over the design to Mattel. We have seen such a flux of articulation in the past with DC, from barely 5 points to a whole mess of points at the cost of the overall look. As far as I can count, Wonder Woman has 17 points. That will allow the player to pretty much do whatever she wants. 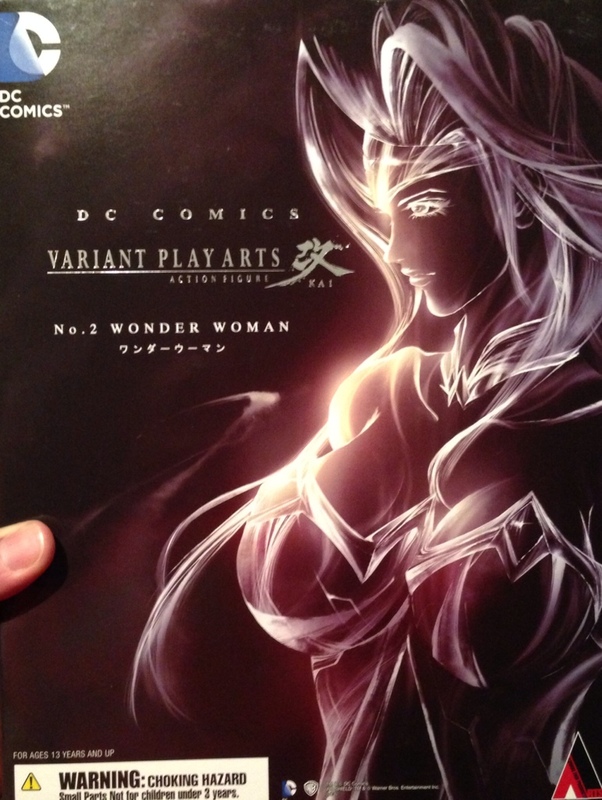 Wonder Woman has a young look. She has a very round face with big eyes. The box shows her with black hair, but this figure definitely has purple hair. Overall a great look. Her outfit reminds me a lot of Wonder Girl’s outfit. We generally see her running around in jeans. Wonder Woman also looks to be wearing jeans. They added the stars to the side. Nice touch. Her top is red, of course, with a gold ‘w’ across the chest and shoulders. She has sleeves of white. I think they should have carried the red from the shirt into the sleeves. She also has red boots with silver wings. Compared to a standard Wonder Woman, DC Super Hero Girls holds up. She is a bit shorter and has a look of a younger girl. A friend of mine is moving from here in California, out to Colorado. In an effort to make his move easier, he began a purging process, which included some of his Ame-Comi and Bishoujo figures. That is to my befit, as I am not in the mood to purge, and actually very accepting of hand-outs. Today is a 2008 classic, Huntress. She is decked out in an amazing layer of cloth and leather. The details are quite spectacular on this figure. I am sure the Ame-Comi team had a great time sculpting this one. She is pretty angry looking. Watch out for her vengeance as well as her cross-bows. I have her in hand. Unfortunately, my camera is in the shop until Saturday. I can’t wait to get her out of the box and show her off.